The other day, someone I work with was telling me about a recipe for hot chocolate she saw in the NY Times that used coconut milk. The author's husband can't have dairy, rice milk, soy milk (and the list goes on) and so she finally came up with a recipe for creamy hot chocolate made with coconut milk. It happened to be very cold and blustery outside, and for the rest of the day, all I wanted was a huge cup of it. I didn't have coconut milk, but I also wanted to avoid having quite that high of a fat content, so I used my latest discovery: Hemp Dream Vanilla Hemp Milk, and adapted the recipe a bit. I ended up with a creamy and wonderfully satisfying cup of hot chocolate to sip as I curled up on the couch with my roommates to watch 30 Rock. You can find the original recipe here; see below for my adapted version. Heat the hemp or coconut milk, brown sugar, and salt over medium heat until the sugar is dissolved. Meanwhile, dissolve 1 tbsp. 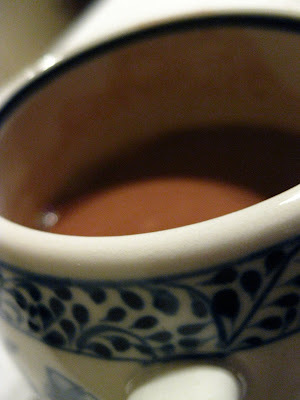 unsweetened cocoa powder in the 1/4 cup boiling hot water and then add the chocolate mixture to the hemp milk. If desired, add 1 tsp. vanilla, but it is unnecessary if you already have vanilla-flavored milk. Add more cocoa powder and/or sugar if desired, according to your own taste. Continue to heat over medium-low heat until you like the way it tastes. Serve by itself or with whipped topping or marshmallows. omg, I love the part about watching 30 Rock! Haha, I'm glad you enjoyed that Kyle :) By the way, are you coming to my brother's Werewolf Bar Mitzvah?